Berlin’s Neues Museum is one of the most moving and enigmatic cultural institutions I have encountered in my life of visiting cultural institutions. Originally built in the mid-19th century by Stüler, student to Berlin’s original starchitect Schinkel, the Neues Museum housed the Ancient/Pre-history and Egyptian Collections and offered a grand narrative of human history from the Tower of Babel till the Reformation. But the belief in unidirectional progress was shattered by the violence of the 20th century. The museum was closed at the outset of World War II and was badly hit during the fighting. Too damaged to recover but too integral to the water table on Berlin’s Museum Island to remove, it remained a war ruin, exposed to the elements for over half a century. 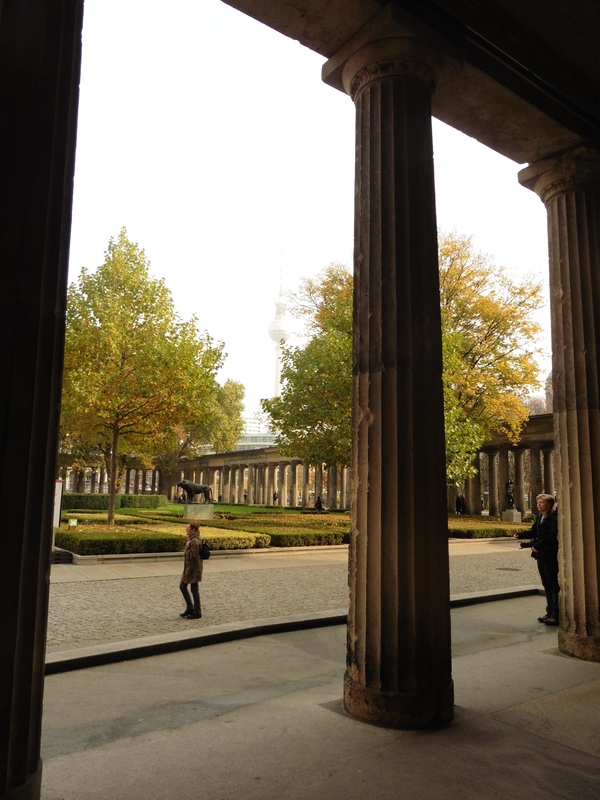 I first visited the Neues Museum in December 2009, shortly after its re-opening. In rethinking and re-establishing the museum, architects David Chipperfield and Julian Harrap created a new architectural language: they froze the ruins, recuperated as much of the original material as possible, built contemporary pieces to recover the building’s original footprint, and then married old and new together. The museum’s fragmentary wholeness offers an image of reconciliation; the violence of the 20th century reads as a scar rather than as a void, a wound that will never close. My doctoral project, Bullet Hole Constellations: Berlin’s Neues Museum, a Case Study in Cultural Memory, articulates the museum’s embedded philosophies and narratives while situating them in larger discourses pertaining to cultural memory. I identified a shift in cultural memory theory and praxis that loosely coincides with the turn of the century. With Berlin as its focus, I trace this shift through three of its museum institutions (the Jewish Museum, the Masterplan Museumsinsel, and the Neues Museum). I specifically look at three aspects: their museum practices (how history is expressed), the main narratives embodied in their spaces (what history is being expressed), and the critical contexts in which they are embedded (what do these practices and narratives mean in the wider cultural context). It also outlines a working concept of cultural memory that focuses on the use, appropriation, and transformation of cultural heritage – a point of view that belongs amidst contemporary scholars seeking to read the contemporaneity of the past as more than the aftereffects of traumatic experience. I am in the process of transforming the dissertation into a monograph and hope to have it with a publisher before the end of the year. Feel free to contact me should you wish to read an excerpt. Every moment of this project was joyful. I never tired of it and my only anxiety was that I was unworthy of the endeavor. The museum embodied all of the ideas and images that had haunted and inspired me since childhood and allowed me to begin to formally articulate the concepts that will guide my work for years to come. It was love at first sight for the museum and I, and while I will move on to other projects, perhaps more mature projects, Berlin’s Neues Museum will always be my first love.